In all my collections I always try to introduce something new as well as a challenge to improve my digitising and your embroidery skills. One of the challenges that I have started to include in some larger sets, is an extra wide design which requires two hoopings in the 12″ by 8″ hoop. 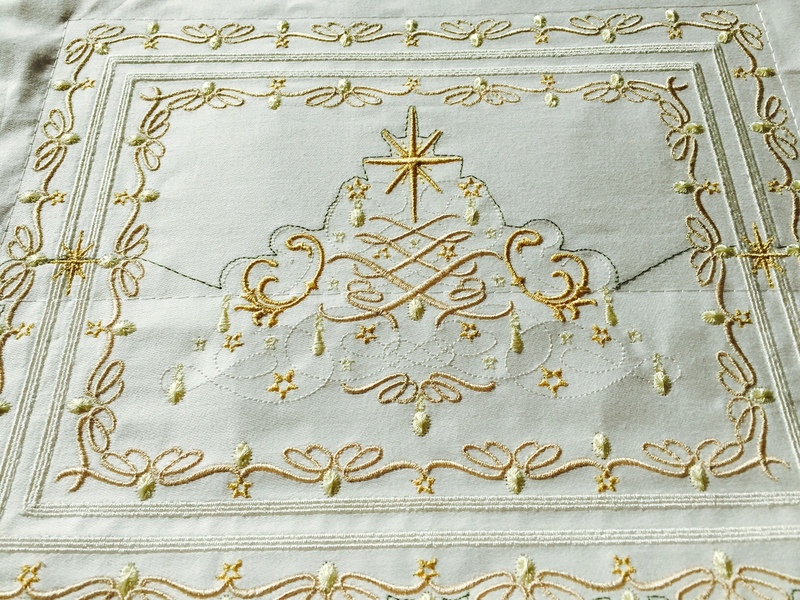 I hope you take up the challenge and embroider this delightful design. No matter if it goes wrong, be assured that I make lots of mistakes but endeavour to learn from them by finding a way to avoid them happening again. Getting to know your machine is so important and you are a “team” that work together. 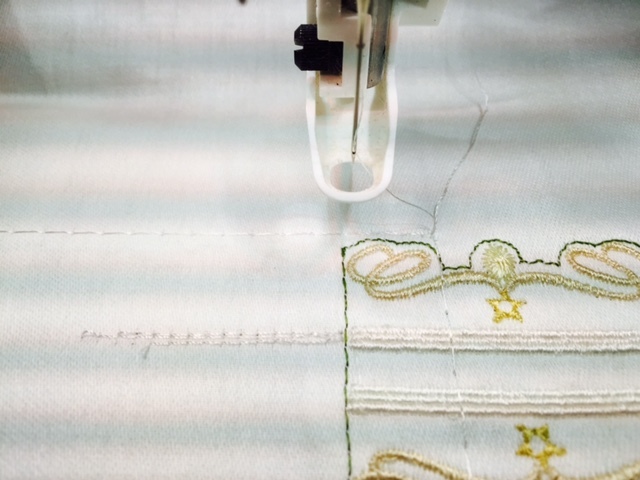 Understanding the tiny differences that adjustments make on your machine is very important especially when you are moving a design as I do later in this post! 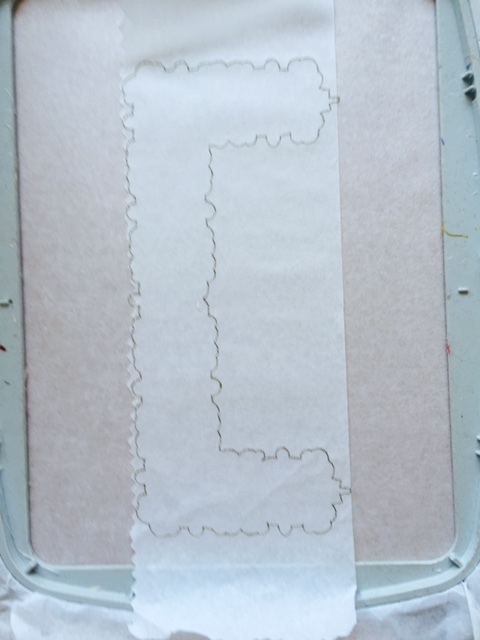 Stitching out the first section is easy but make sure you leave enough fabric for the second part! 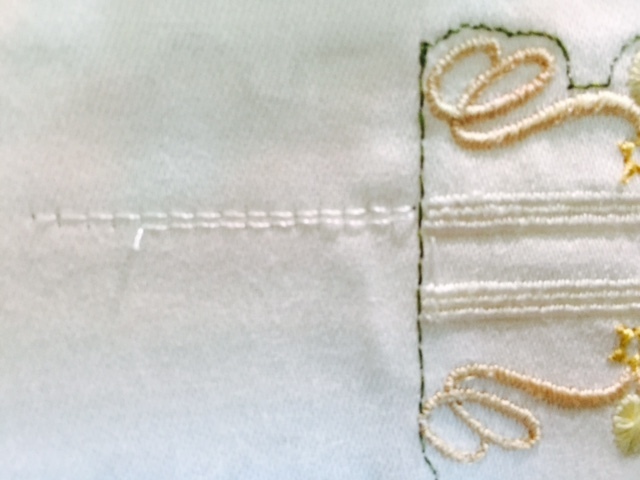 Then hoop just your stitch and tear stabiliser so you can stitch the first set of Outline alignment stitches (OAS) which give you the outline of the second design. I have made this image large so you can see the detail which is very important. I aligned the star so it sat in the middle of the OAS which can just be seen underneath and also at the top and bottom points marked with the green arrows. 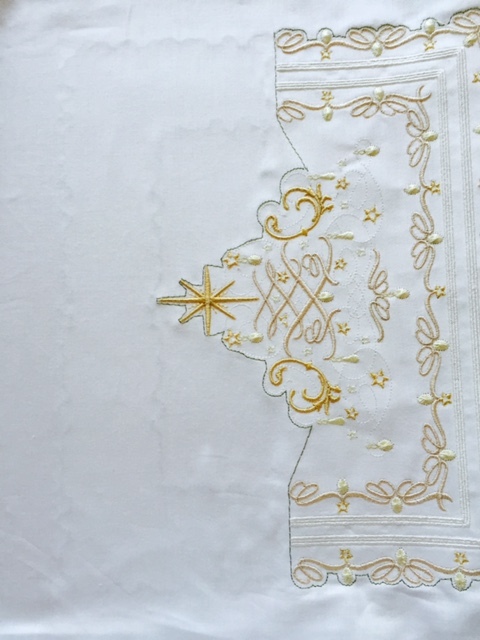 When I thought it was all aligned I attached my hoop and I moved to the first colour of the design which starts with the underlay of the narrow bands of satin stitches. 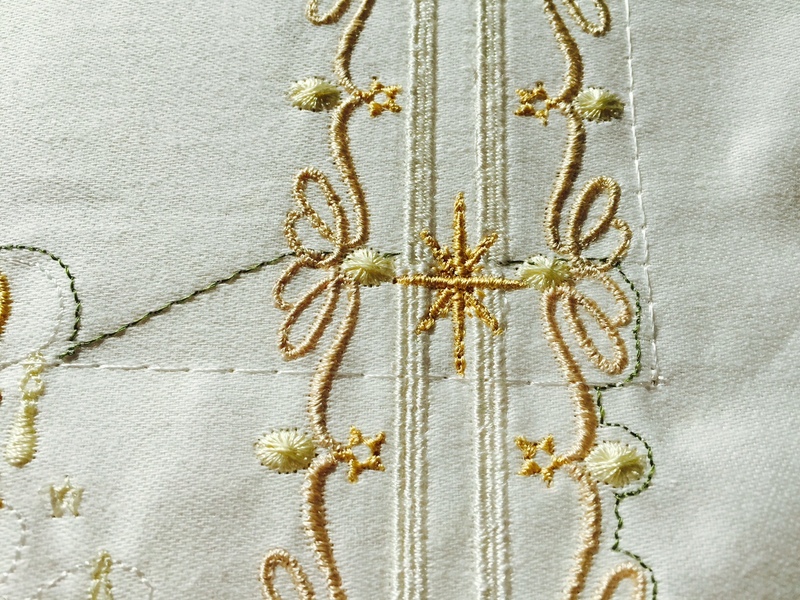 By stitching a small row of these you can see whether you are aligned accurately. I wasn’t so instead of moving the fabric in the hoop, I decided to move the design on my machine. Not something I do very often and this is what I meant earlier about knowing your machine. Here you can see the first few stitches and the next set when I moved the design. Still not quite right so I moved it up again! Now I remembered something very important here which I learnt when I first got my Husqvarna Diamond and attempted my first precise positioning. If you want to check your alignment it is essential to remove the hoop from the machine and look down on your work directly above it (photo above), rather than looking across at it (photo below). After the third slight movement of the design I thought I had it just right and did not do the “above” check. 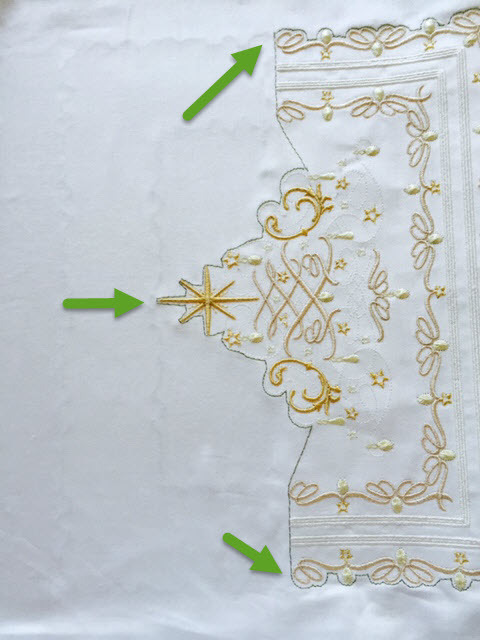 I used the second set of outline alignment stitches (OAS) to attach the fabric to the stabiliser and this also is another guide, as is the first complete set of underlay. Look to see where it finishes. I found that the lines were just a little out so I will have to practise more and will also add a few more alignment stitches to help you! 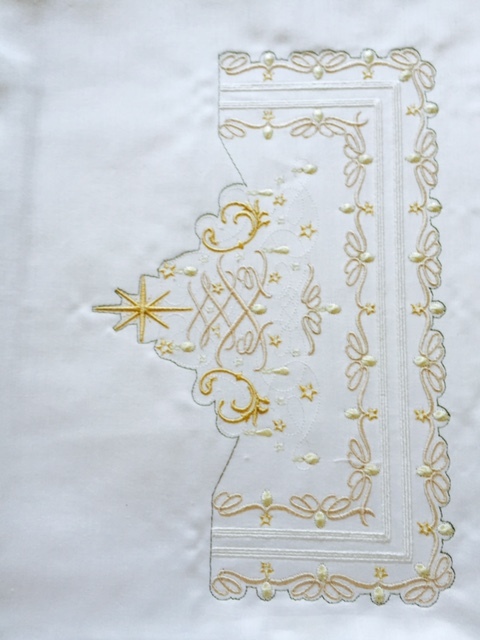 This is the harder version of this design for advanced embroiderers but if you manage it think how pleased you will be with yourself and you may the courage and confidence to attempt another challenge. The easier version has stars in the corners so any slight misalignment will not be so evident. However one last word, I would never be digitising if I had not pushed myself to do what I thought was impossible! The set will be released very shortly. Enjoy and share your experiences! I forgot to say that I will add the complete design in the set for those with commercial machines! It’s beautiful, Hazel. I wish, wish, wish I had a machine with a large enough hoop to embroider this. 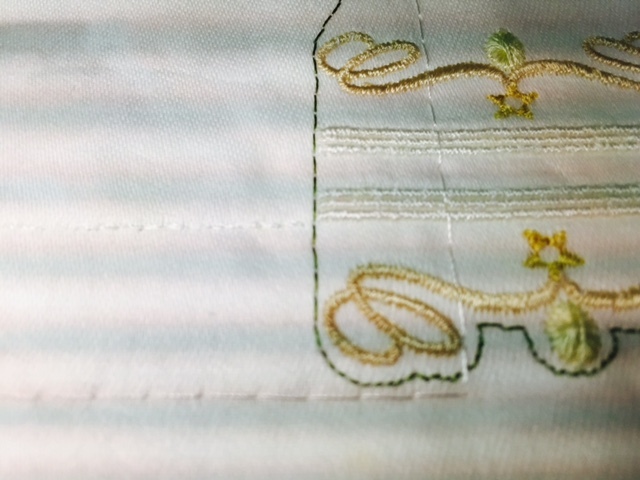 I love reading about how your designs came to be, how you embroider them and all the other details.